LONDON--(BUSINESS WIRE)--Quantzig, a global analytics solutions provider, has announced the completion of their latest article on the key reasons why web analytics matters for businesses. At present, many businesses have established their online presence. But with the huge data and traffic that online platforms offer, it might become difficult for businesses to gain a complete outlook of their online consumers’ behavior. This is where web analytics comes into the picture. Web analytics offers data about your website, your visitors, and their behavior so that you can analyze what’s working and what isn’t and recover your website’s performance and conversion rates. Website data analytics tools help companies to get detail information on the demographics, user behavior, age, gender, and source of traffic. Using web analytics, organizations can gain direct insights into how the website is acting and what the customers are saying about the products or services. 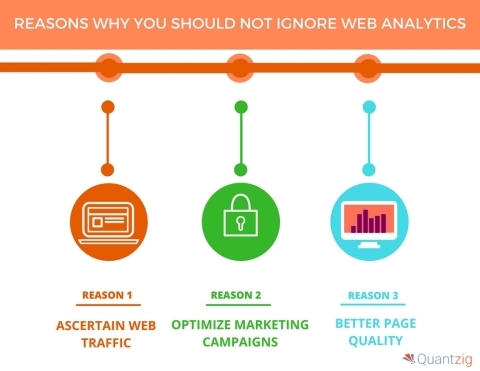 In this blog, Quantzig has listed the key reasons why web analytics matters. Speak to an expert to know more about the scope of our research. Ascertain web traffic: Web analytics helps assess the number of viewers visiting a particular website, where they are coming from, and the keywords used by them. It shows the number of visitors coming to the site from different sources like emails, search engines, social media, and display ads. Also, it shows the number of conversions through each of these platforms. The information is important for any business and helps them choose the channels that they should pay more attention to and invest in. Optimize marketing campaigns: Marketers can quantify the performance of campaigns and know which campaigns bring the best results using web analytics. Organizations can align their resources in the right channels and the campaigns that produce maximum returns. By doing this, marketers can invest time in enhancing the right strategies and drop the strategies that aren’t working; thus, increasing their return on investment (ROI). Book a solution demo to know more about the key reasons why web analytics matters for businesses. Better page quality: With showing changes in trends over time, web analytics is meant to help businesses see the differences in data on a week-on-week basis. But they must take precautions before concluding too quickly. It must be guaranteed that with the trends and segmentation, organizations are able to find out what is driving people away from their site. Visit our page, to view a comprehensive list of the key reasons why web analytics matters for businesses. Request a solution demo to see how Quantzig’s solutions can help you. Web analytics help companies to gain direct insights into how the website is performing and what the customers are saying about the products.